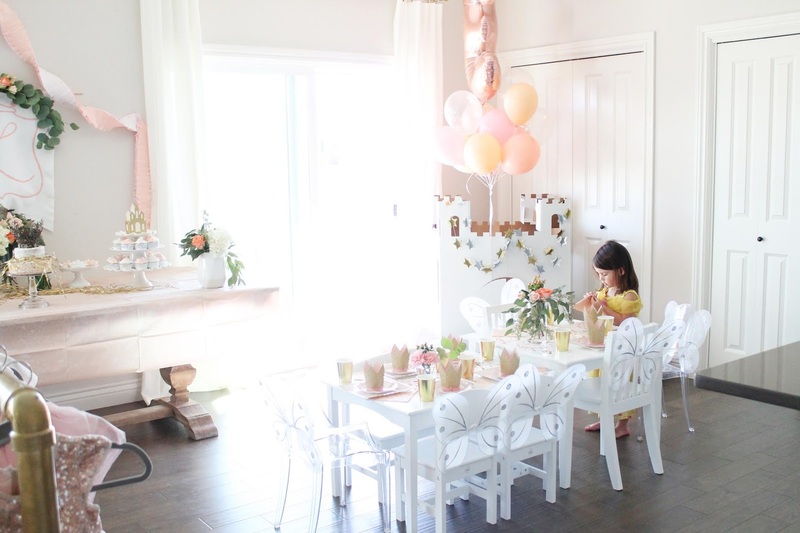 One thing I've learned is that I adore throwing our daughter birthday parties. 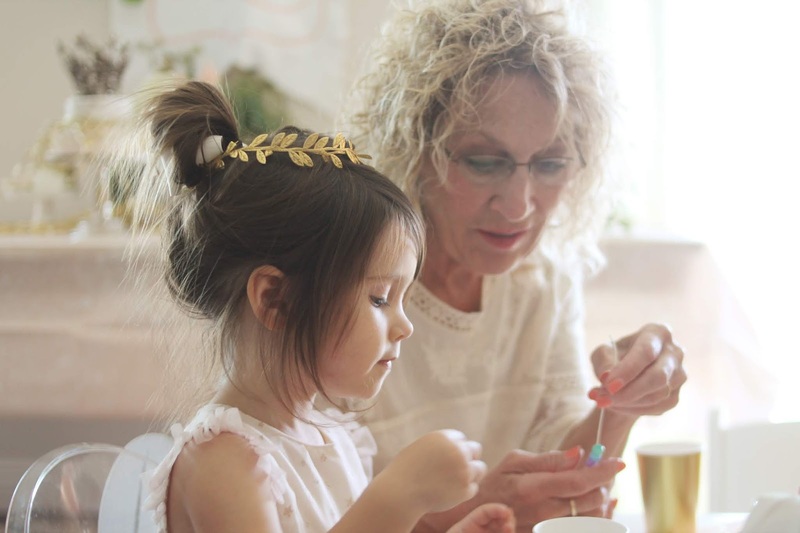 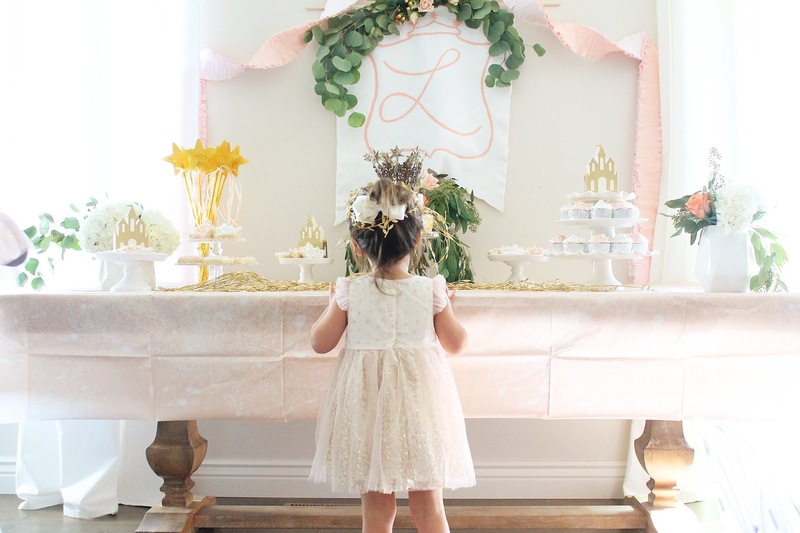 There is just nothing quite like the magic and sweetness of a little girl party. 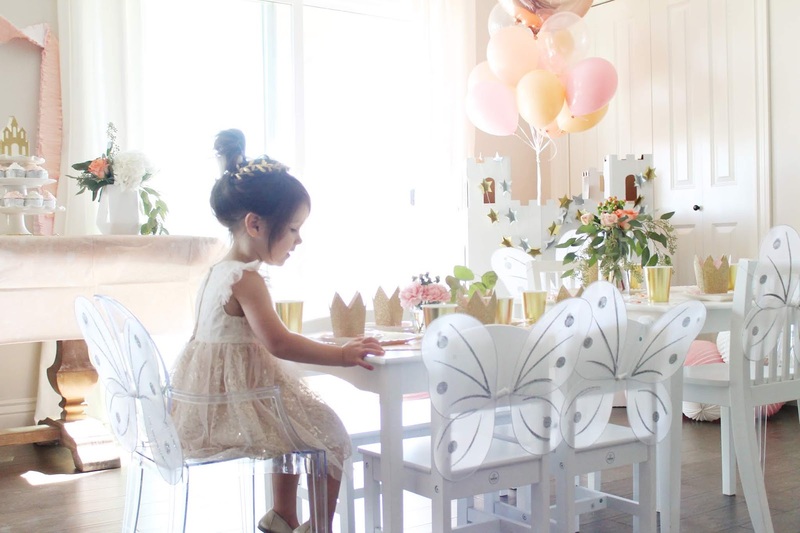 You can see her first birthday here and her second birthday here. 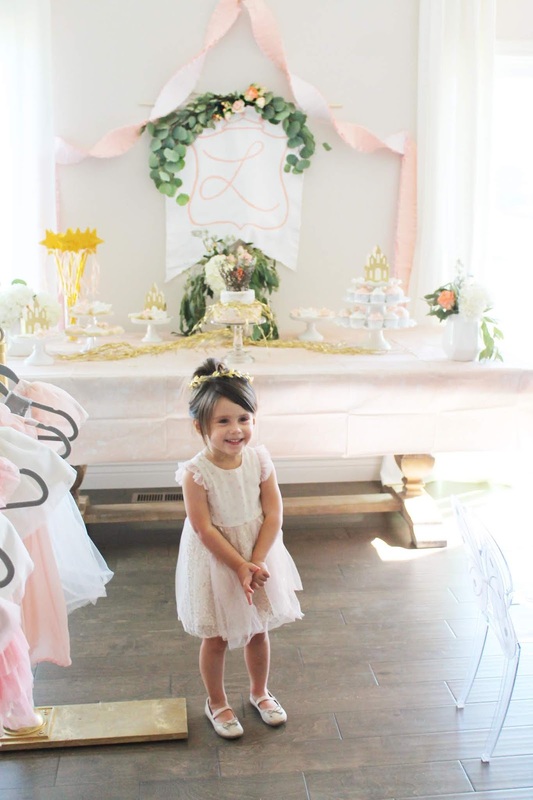 This is the first year she's had an opinion on the theme and since she's obsessed with all things princess she requested a fete fit for royalty this time. 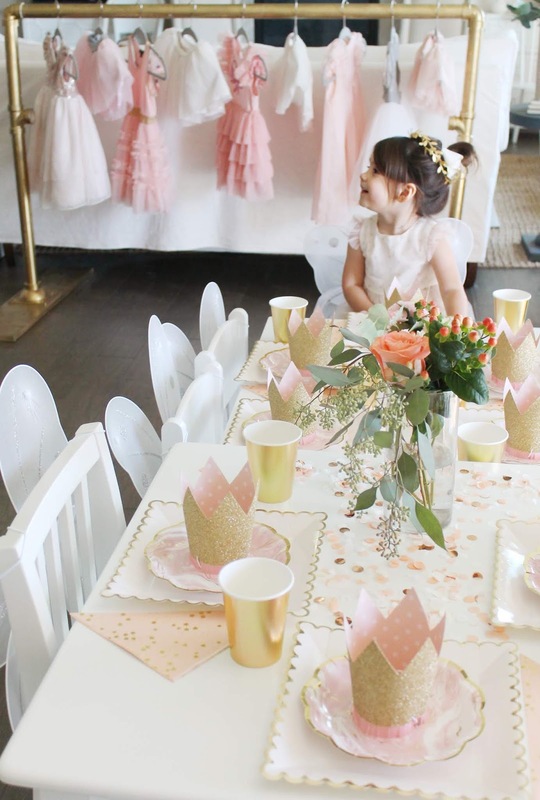 Luckily her favorite color is pink and she's into all things sparkly so it was pretty easy to put together a party that made her happy. 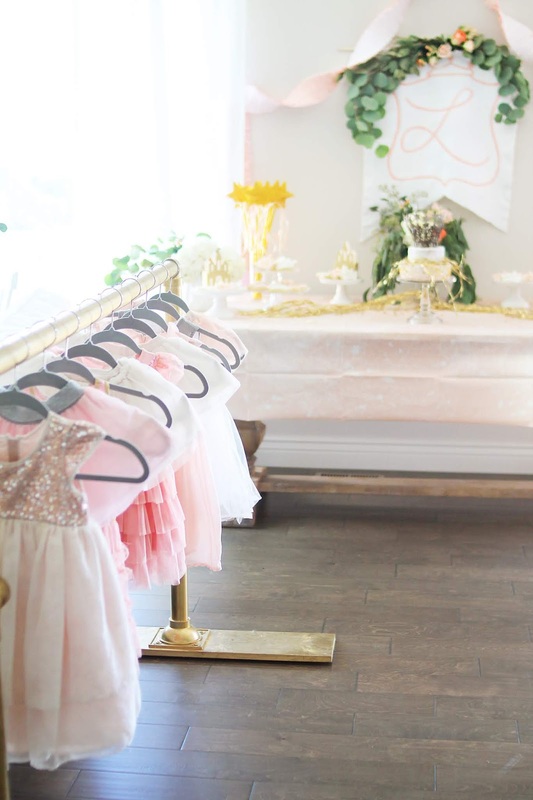 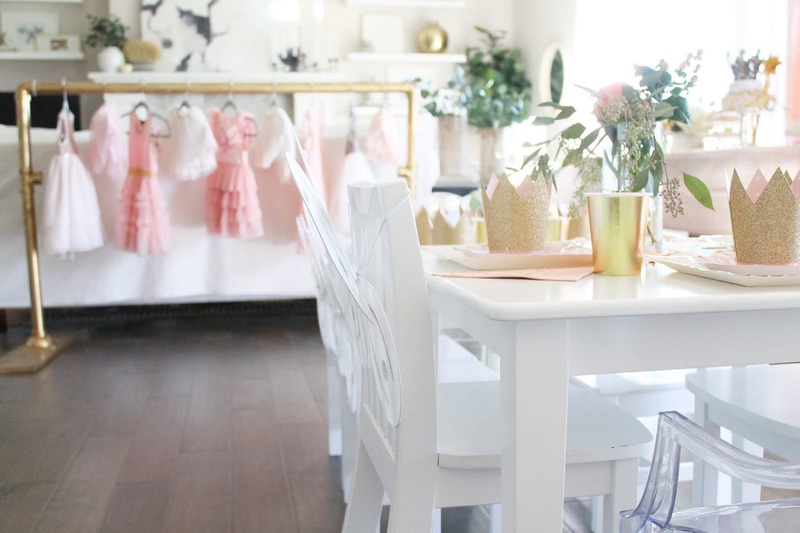 I borrowed this great DIY ballet bar from a friend who had thrown her daughter a ballerina party and reused it as a garment rack for pretty princess dresses for all the girls. 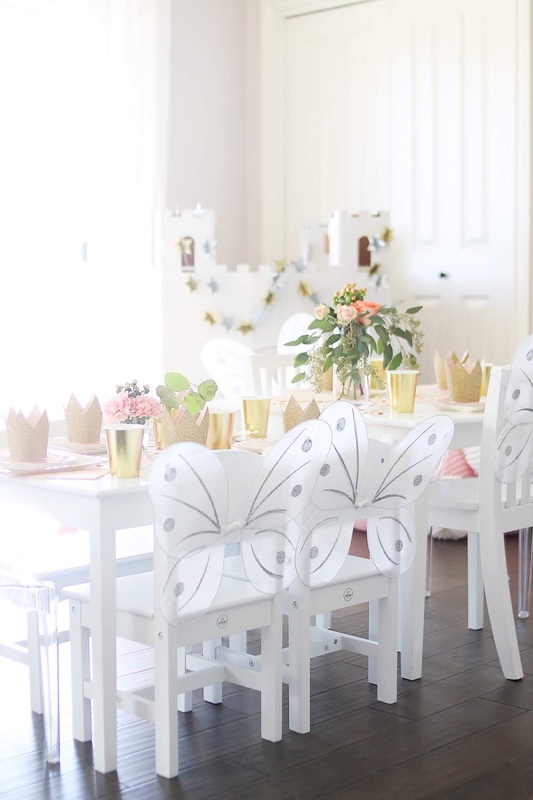 It's PVC pipe spray painted gold if you're looking to make your own! 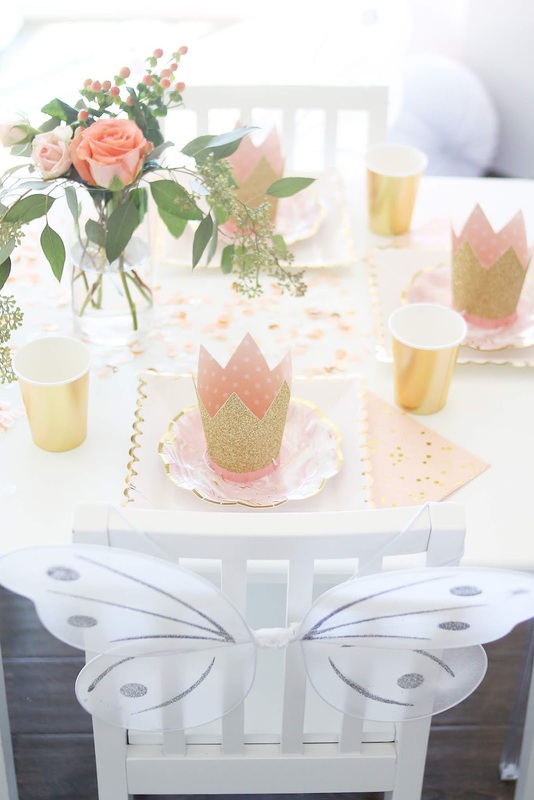 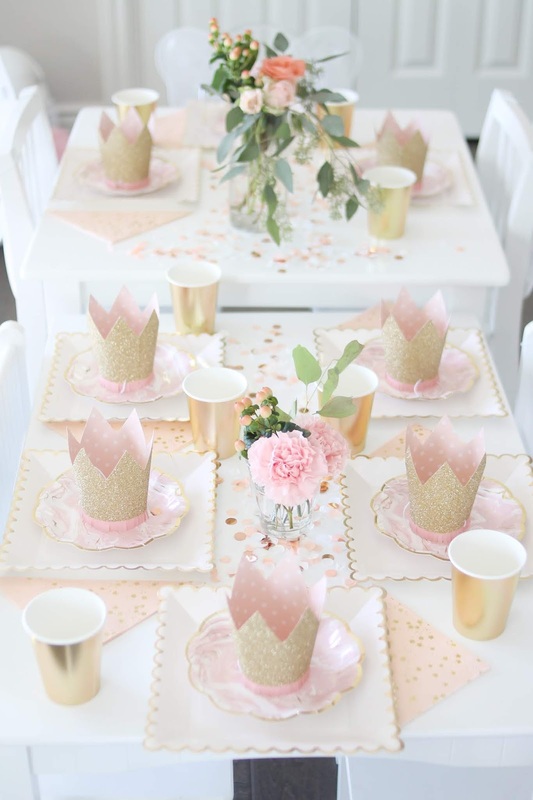 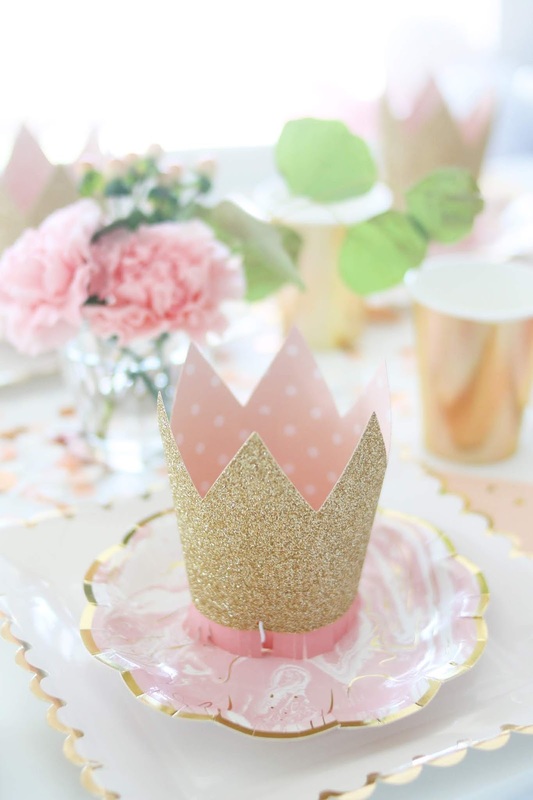 I layered the kids' table with these scalloped plates and these marbled ones and finished them with the most darling petite crowns. 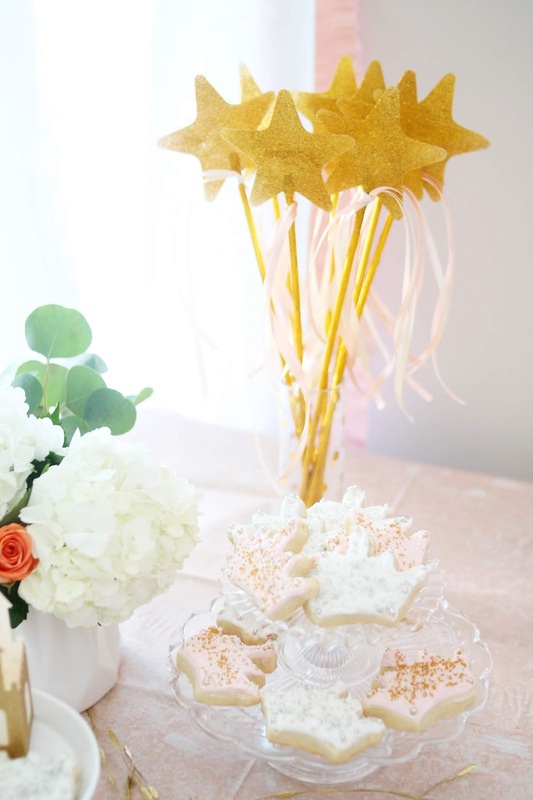 A sprinkling of confetti tied it all together. 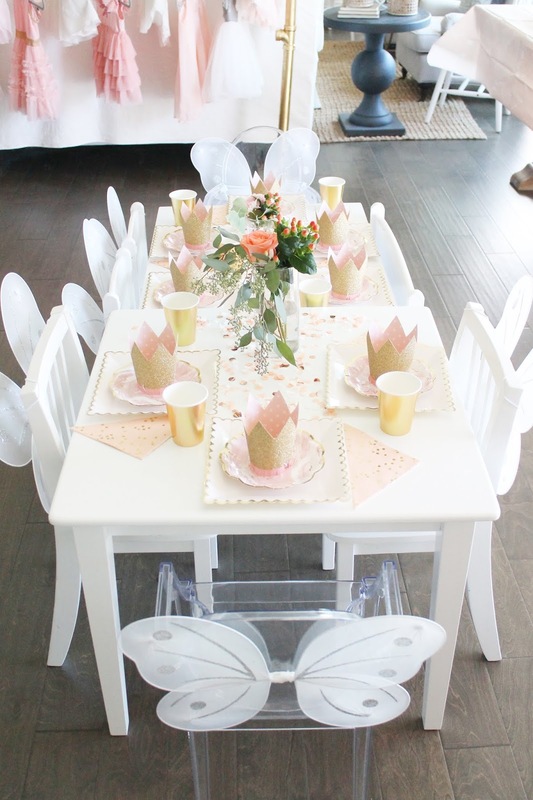 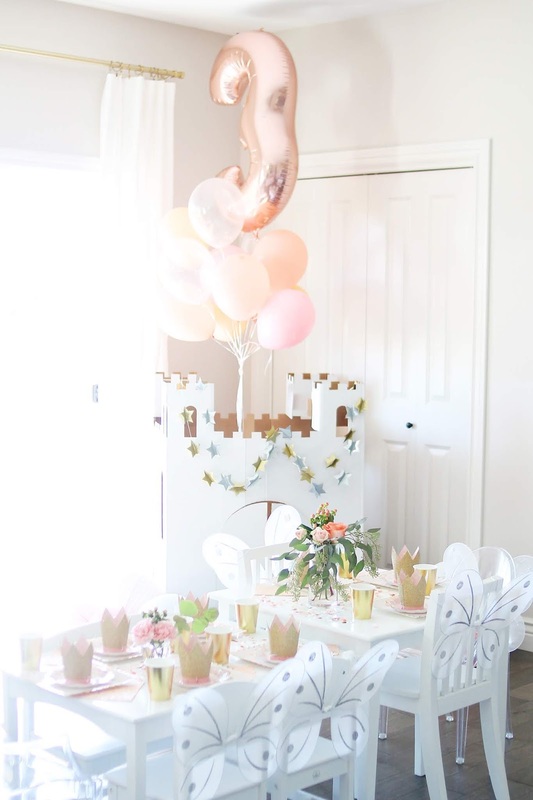 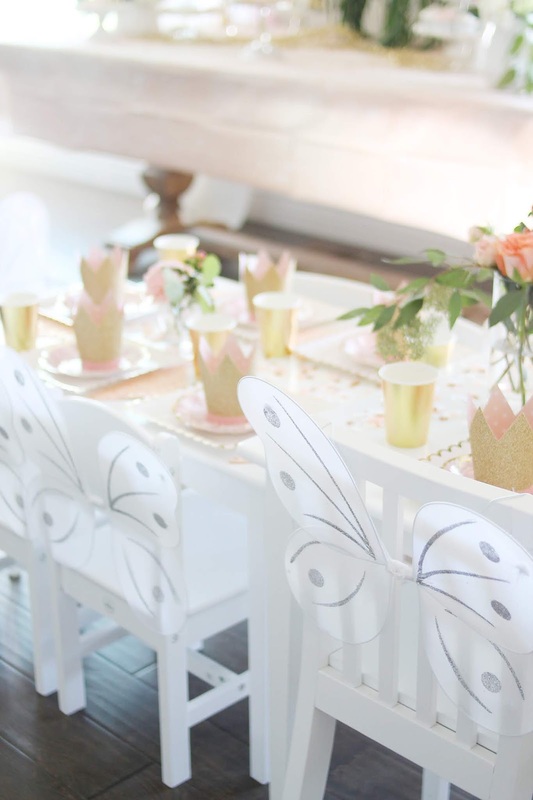 I added white fairy wings to each of the girls' chairs which made it so ethereal and they loved putting them on during the party. 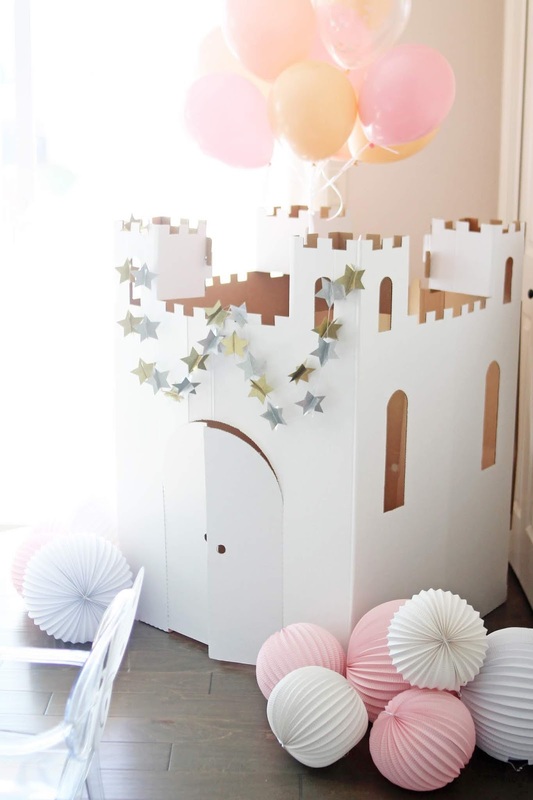 The white cardboard castle was a gift at her last party and fit in perfectly this year. 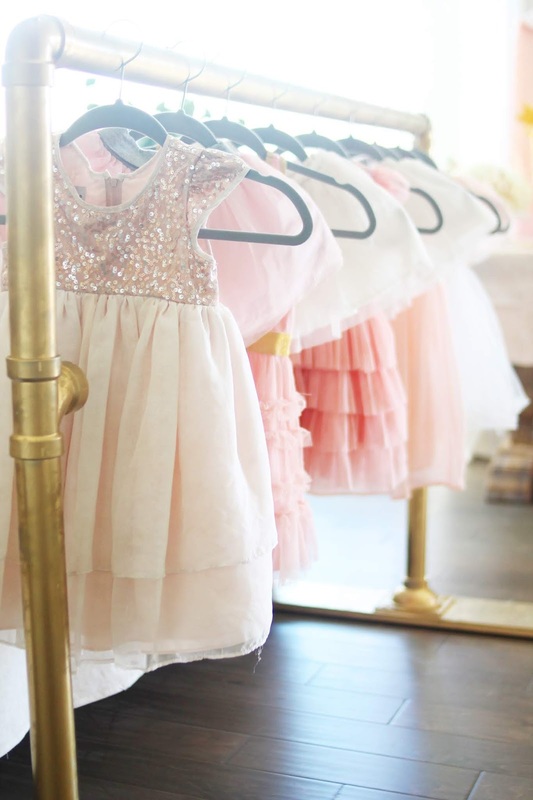 The kids loved going in and out of it. 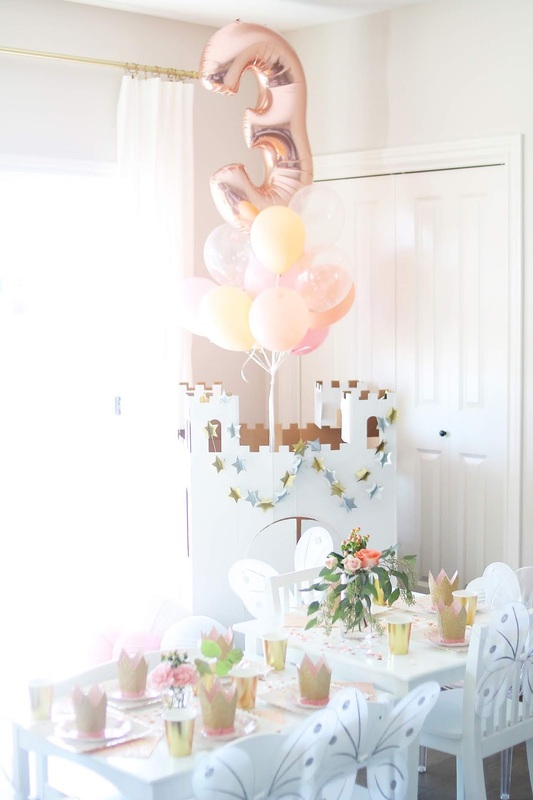 We dressed it up with some star garlands, paper lanterns and these pretty balloons. 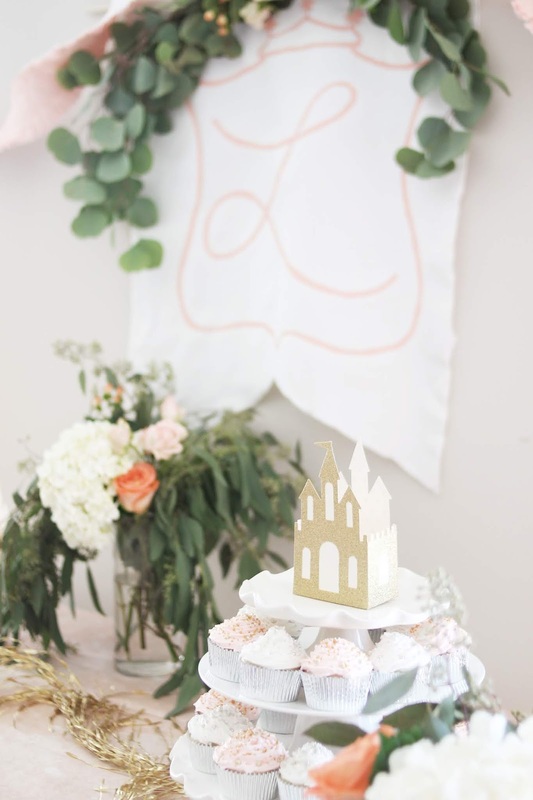 I searched and searched for the perfect invitation and couldn't quite find what I was looking for. 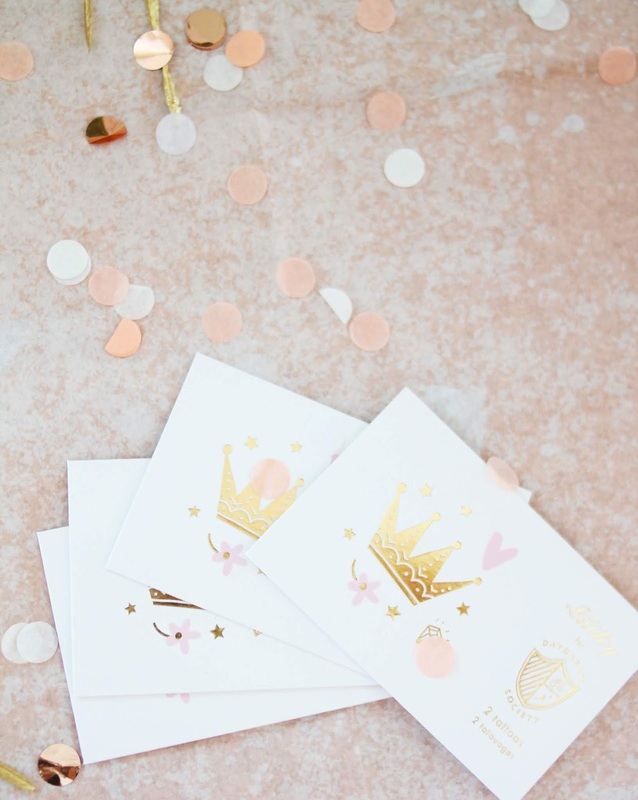 Luckily my friend Stephen of Ink Floyd Design saved the day with these darling custom invites that were exactly what I had envisioned! 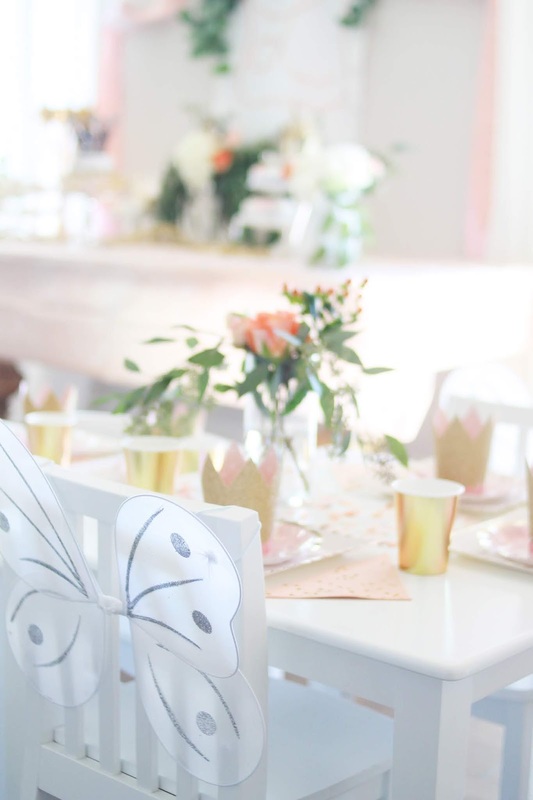 He is actually the one who designed my 12th and White logo and this blog so you know I totally trust him! 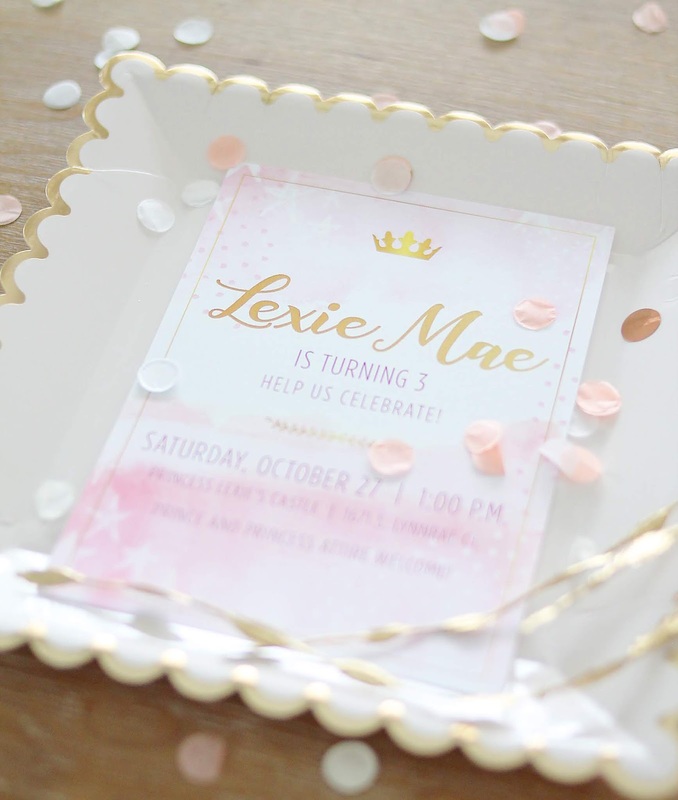 If you need custom party invitations or any other design work, I can't recommend Ink Floyd enough! 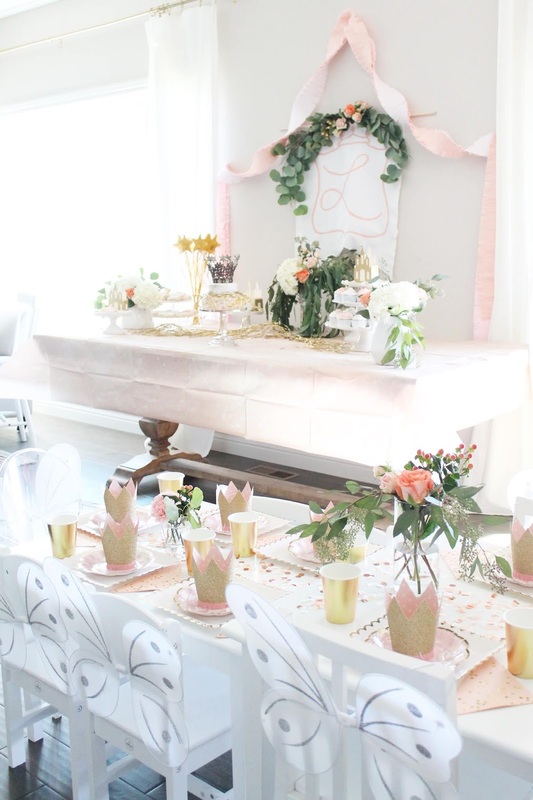 The dessert table is always one of my favorite things to decorate. 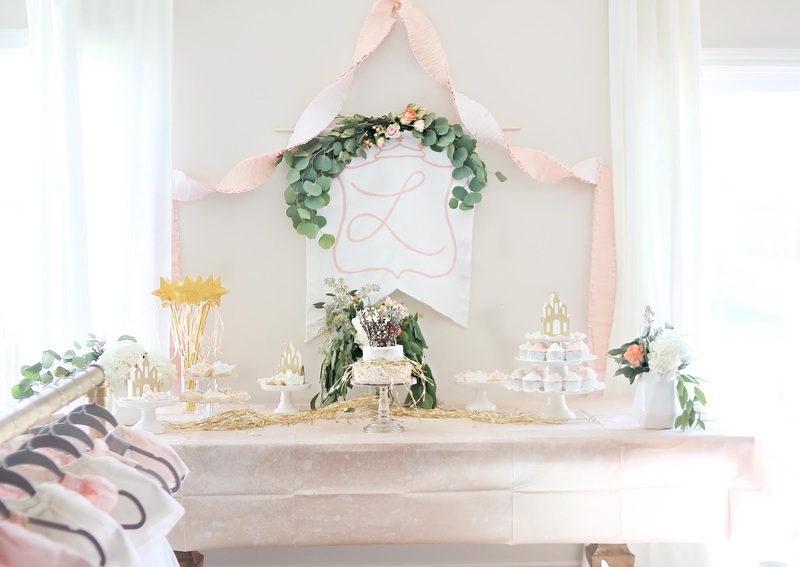 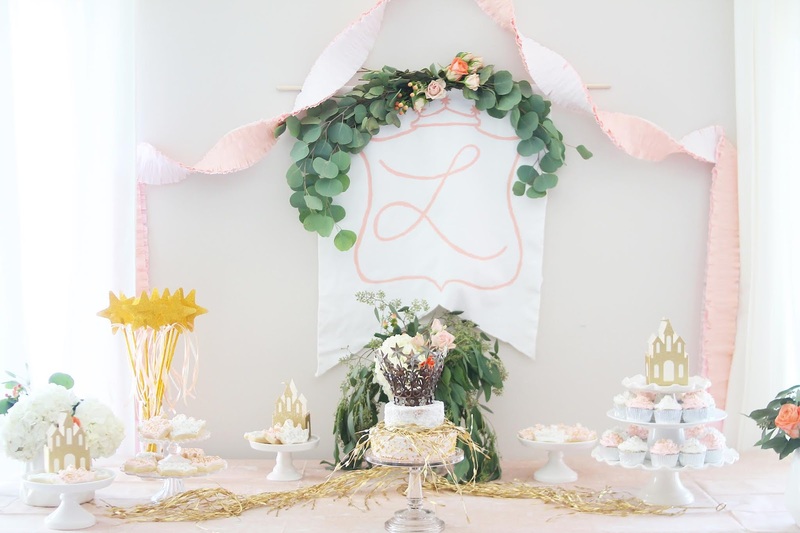 I've found the key to any theme party is definitely a large focal point, so I DIY'd these royal crest banner complete with a script L. I added silver dollar eucalyptus and blush roses the morning of the party, and created a swag with these darling crepe paper streamers. 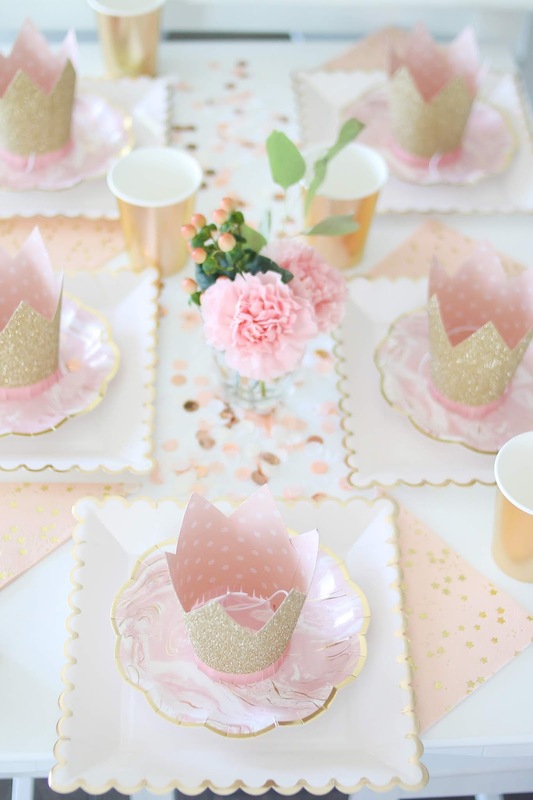 I think I'll probably use these for every party from here on out because they're just so pretty and the colors are perfect. 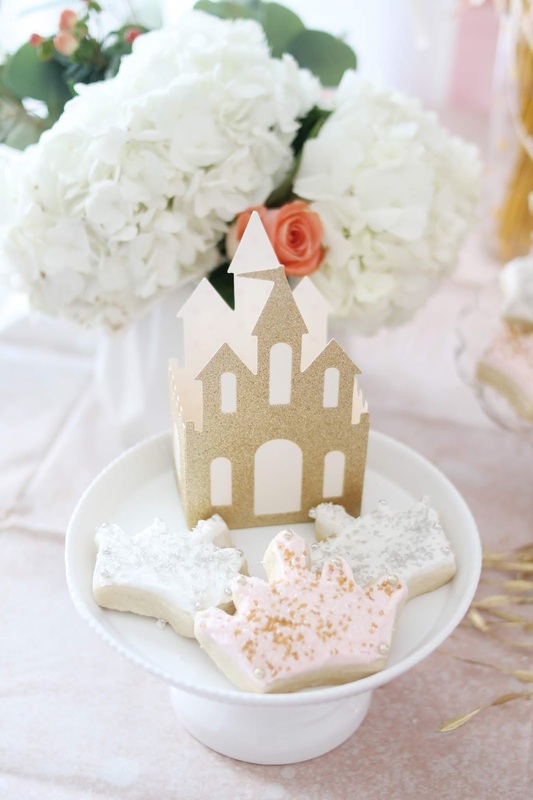 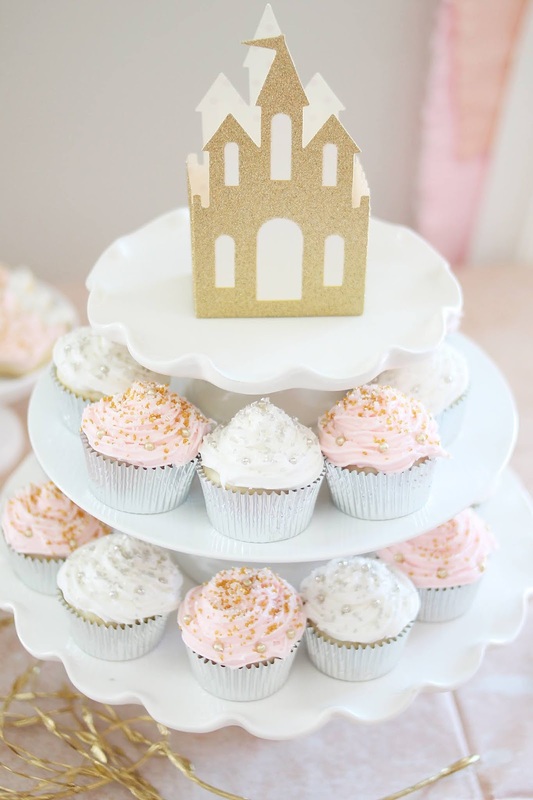 These cute little castle party favor boxes were perfect for dressing up the dessert table and carrying the theme through. 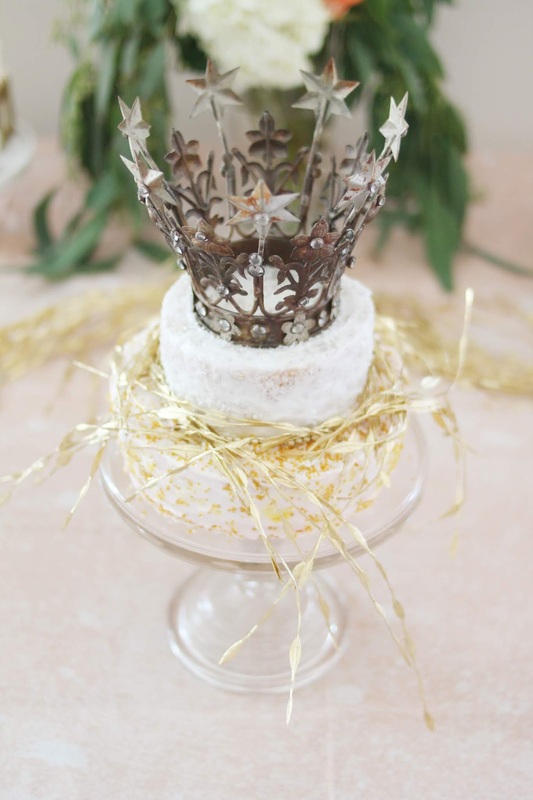 My mother-in-law again outdid herself with all the desserts including the cake, which I topped with a gorgeous metal crown. 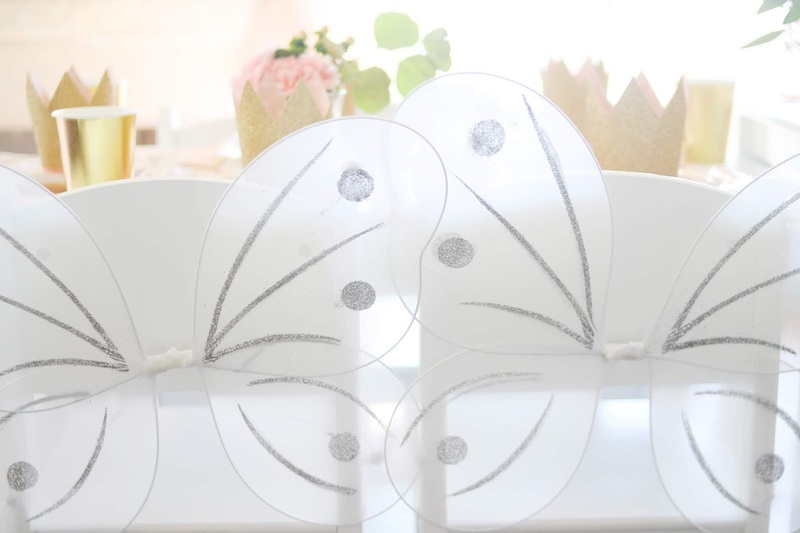 I found the prettiest princess tattoos that were such a hit! 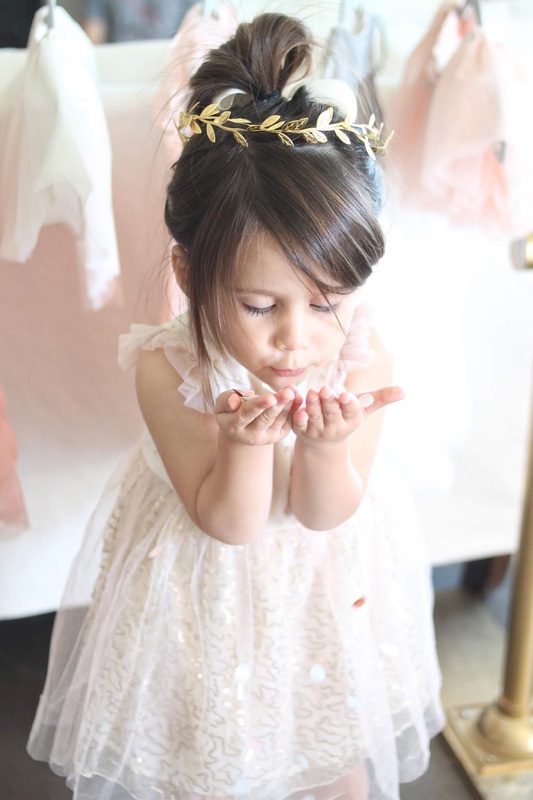 She was all kinds of precious! 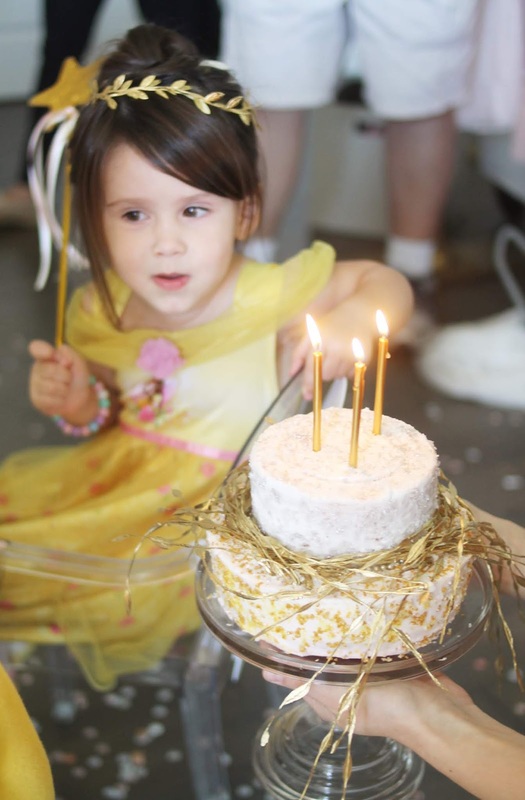 Of course I had bought her this darling dress to surprise her with and all she wanted to wear was her (borrowed) Belle pj dress. 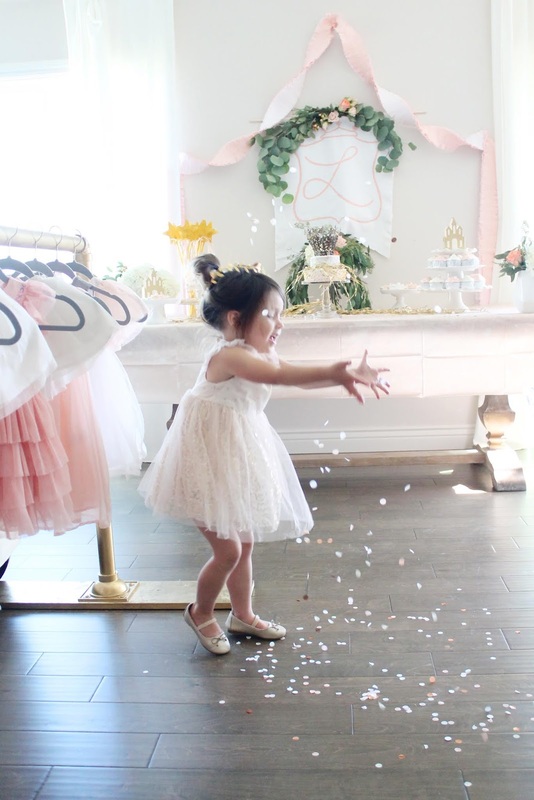 We let her throw confetti before all her friends arrived and it was so darling and SUCH a mess! 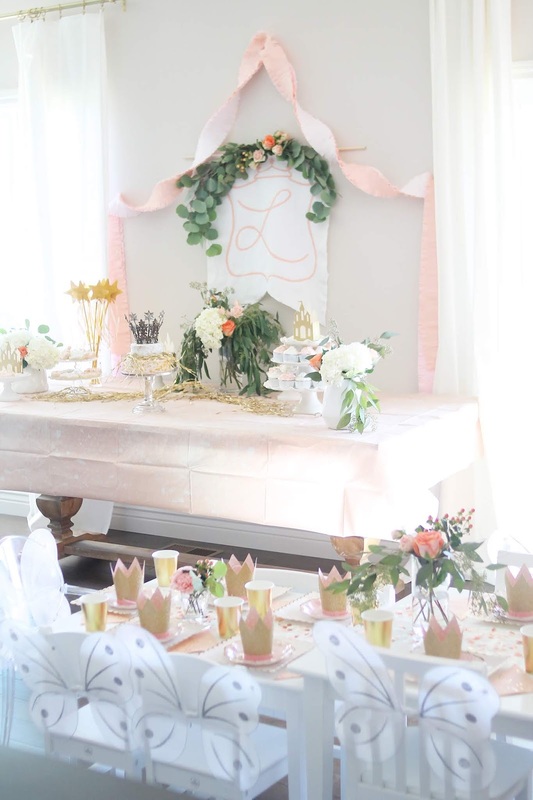 We didn't clean up til the next morning and it looked like there had been a (pink) frat party in our living room haha. 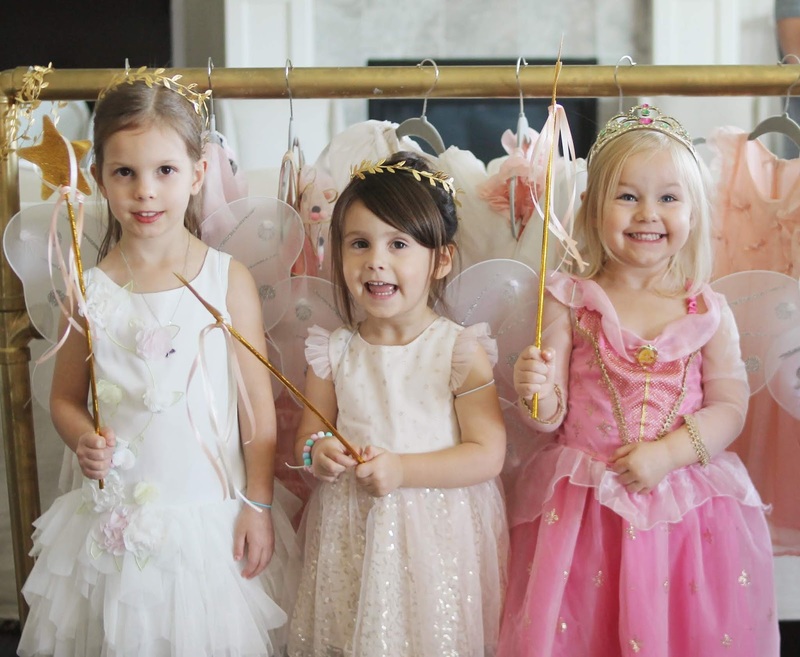 A few of the little princesses - how cute are they?! 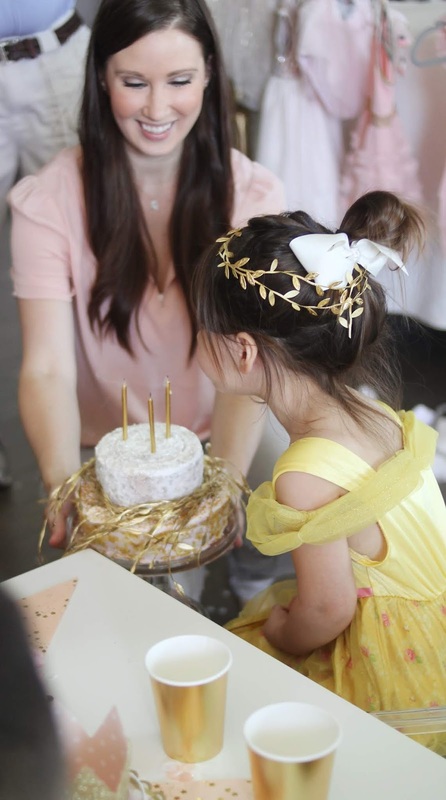 Happy birthday baby girl! 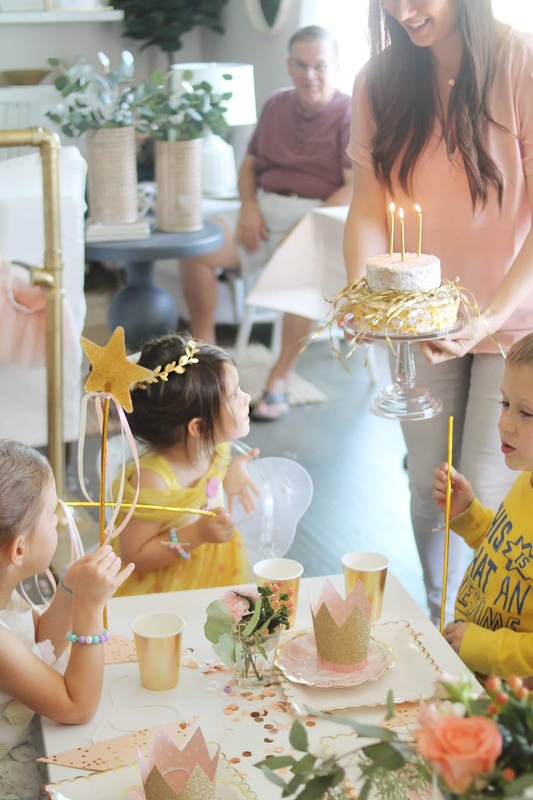 We loved celebrating you!